How much does the CEA program cost? The cost of the program is $1,495 plus applicable tax. Other organizations may charge less for current members. Ongoing access to the 1,000 term glossary. Use of valuable CICEA members-only tools and resources. Use of CICEA proprietary executor-focused calculators. Professional profile on the national Find A CEA Directory, enabling executors and CEAs to search by profession and by geographical area. Chapter membership includes all of the benefits of general membership plus being a member of the CICEA regional chapters which will hold meetings for social and business networking with the seventeen CEA professions and provide expert speakers on executor issues. *Membership fees are invoiced on the anniversary of your registration with CICEA. Is the CEA program approved for continuing education credits? Is Certified Executor Advisor an Online Course? Yes. The CEA program was written and designed to be presented on-line, using a world-class educational platform similar to those used by universities. It includes images, charts, graphs and other visuals to enhance the learning experience, and provides easy navigation through the modules. This allows CEA candidates to move through the material at their own pace and at their convenience, including writing the exam whenever and from wherever they wish. In addition, the curriculum is available for purchase at anytime for members or at the time of registration. What does the cost of the CEA Designation program include? The cost includes access to the full curriculum which, unlike programs focused on one or two disciplines, provides a broad overview spanning the 17 professions executors may turn to in the course of their duties, all written by experts in their field. It also includes the 1,000 term glossary and two exam attempts, all conveniently located online, for anytime-anywhere access, using a world class educational platform. In addition, CEA members enjoy ongoing access to the most current curriculum and glossary, use of the instantly recognizable designation, a professional diploma, a professional listing in the national ‘Find A CEA’ Directory, and use of CICEA executor calculators, articles, links and tools. The CEA Designation program has also been accredited for up to 30 hours (varies by institution) of continuing education credits with numerous regulatory bodies, including the IAFE (Advocis), the FPSC, CECAP (IIROC), CAAMP, and others. Who should become a CEA? Why aren’t there seminar sessions? As noted above, the CEA program was designed from the outset to be an online program and as such, it doesn’t lend itself to a classroom type environment. The e-learning structure negates the need for travel, facilities and coordinating schedules of the various participants. Are classroom-style seminar sessions available? As noted above, the CEA program was designed from the outset to be an online program though we understand some people prefer a classroom-style seminar learning environment. The e-learning structure negates the need for travel, facilities and coordinating schedules of the various participants, though we are currently experimenting with classroom sessions for groups of 60 or more, delivered with an additional charge to cover costs . Where can I register for the CEA program? Can I access my CEA Course on my iPad or tablet? Can I access the CEA Course on more than one computer or am I limited to a single computer? Your program can be accessed from any computer, anywhere, with your password and log-in code. Am I able to download or print the material? No, we have recently switched to HTML which will allow for better functionality and increased search options. However, you can purchase the CEA curriculum binder here. Can I review chapters after completing them? Yes, each chapter can be viewed as often as you wish, including after successfully completing the exam. Can I use the letters ‘CEA’ after my name when I pass the exam? Yes, and we encourage all graduates to do so as it helps raise the awareness of the designation and the institute while also enhancing the professionalism of your practice or business. Once I have the designation, should I offer my services as an executor? No, and by the time you complete the CEA program you will understand why not. Simply put, there is too much risk involved. We recommend CEAs support executors in their role, while offering the products and services in which they have expertise, using the CEA network to bring additional relevant expertise as and when necessary. Is there a practice exam? Yes, you can find a practice exam by clicking here. Keep in mind that the registration cost includes two exam attempts. How long does the exam take to write? The exam is 50 multiple choice questions and should take approximately one hour to complete. There is a time limit of 120 mins. How long does it take to get exam results? Exam results are provided immediately upon completion. This is another benefit of e-learning. If I pass, when will I be able to use the designation, establish my professional profile in the Find A CEA Directory and receive my CEA diploma? You can use the designation immediately. Your profile will automatically be uploaded to the directory and you can edit it immediately thereafter. Your diploma will be delivered within approximately ten business days of passing the exam. What happens after I complete the exam? 4) you are immediately authorized to use the CEA Designation as a member. CEAs are required to complete 15 hours of continuing education (CE) each year starting in their second year of membership to ensure they remain current. Continuing education should be in the areas of executor issues, estate planning and federal and provincial legislative changes. Time spent reviewing the regularly updated curriculum should be counted, as well as time spent reading relevant newspaper, magazine and online articles, and / or attending applicable educational sessions. Yes, your diploma will be mailed to you within ten business days of successful completion and measures 10.5” x 13”. Diplomas are not framed so you can coordinate framing with other professional designations. What is the national 'Find A CEA' Directory? This is the list of all Certified Executor Advisors across Canada, allowing executors and referring CEAs to locate you by profession and by geographical region. How do I edit my profile on the 'Find A CEA' Directory? After logging into www.cicea.ca you are able to edit your profile in My Account. You can upload a photograph and write a description outlining your area of expertise. When writing your profile, consider the type of client you ideally prefer to work with, and the strengths of your practice that add the greatest value for them. 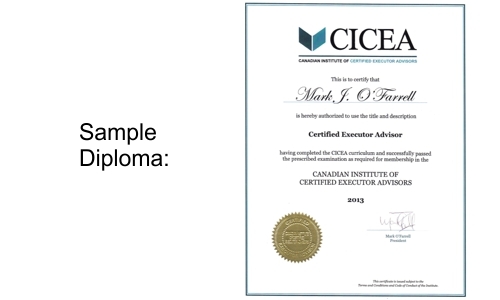 CEAs are regulated by the Canadian Institute of Certified Executor Advisors. With 17 member occupations / professions, there is simply no other existing regulatory body that would be relevant for all members. CICEA provides a professional Code of Conduct, Terms and Conditions, contact for the general public to register compliments and complaints regarding CEAs, a review process and disciplinary committee. How can obtaining the CEA enhance my practice or business? This topic is covered in detail for all occupations and professions in module 7, but for the time being, consider the added value of being able to generally help executors and testators in a wider spectrum of their concerns and issues, and being able to present yourself to them with a designation which is instantly recognizable to them that you are such a professional. There are a vast number of ways accountants add value in estate situations, with both planning and execution of executor’s duties, many of which may not have been appreciated by those in your community until now. Sixteen other professions, all working with executors and testators, will be far better educated about what you do, having taken the CEA program. This is a remarkable new network. Appraisers provide important work in estate situations and, in a growing number of jurisdictions, the cost of a professional appraisal is seen as insurance protection from lawsuits. The professional appraiser has never been a more important member of this network. Consider now that sixteen other professions, all working with executors and testators, will be far better educated about what you do having taken the CEA program. This is a network in which you should belong. Auctioneers play huge roles in estate situations, from contents management and liquidation to jewelry, collectibles and real estate auction, many of which may not have been appreciated by those in your community until now. Sixteen other professions, all working with executors and testators, will be far better educated about what you do, having taken the CEA program. This is a remarkable new network. Banks are in a tremendous position to identify executors (via CSRs accepting deposits) and assist them with money management, from estate accounts to investment information and accounts for beneficiaries, to mortgages in liquidity challenged estates. The opportunities are endless but with no one currently in the branch to engage executors in the first place, these and valuable Agent for Executor services are usually provided to only about 1% of customers. Every branch can benefit with a CEA. Bankruptcy trustees provide unique services that can change lives, yet so many people know little about them. By then, stress may have caused irreparable harm to their jobs, marriages and even their health. Many of these arise in challenged estate situations. Sixteen other professions, all working with executors and testators, will be far better educated about what you can do to help, having taken the CEA program. This is a remarkable new network and one trustees across Canada should be joining. Corporate executors offer tremendous services for some of the most complex estates in Canada, and can be valuable associates for Certified Executor Advisors when encountering estates that are beyond the DIY executor. Sixteen other professions, all working with executors and testators, will be far better educated about what you do having taken the CEA program. It’s more than a network; it’s a huge filter. Like banks, credit unions are in a tremendous position to identify executors but can benefit even more so from their closer relationship with members, rather than clients. Having Certified Executor Advisors in the branch is the perfect conduit between executor’s needs and the credit union’s Executor Ease services. Credit unions can further leverage this with CEAs to expand planning services with testators. Financial Advisors can add the CEA designation to differentiate themselves as those working with executors and testators, adding considerable value while building assets, expanding their client base and identifying insurance opportunities in and outside of their practice. Any financial advisor interested in growing their practice should not ignore the massive transfer of wealth, estimated at $1.5 trillion dollars over the next 20 years (source: STEP Canada). Funeral directors have become highly service oriented in order to build close relationships with families and further discussions about their own planning. The CEA designation is a great way to demonstrate instant recognition as someone who can provide far more than just death certificates. Sixteen other professions, all working with executors and testators, will be far better educated about what you do having taken the CEA program. When it comes to networking and marketing, there is simply nothing quite like CEA for funeral directors. The move to specialization in the practice of law has been beneficial for clients but can be unfortunate for lawyers trying to effectively communicate their specialty and market to new clients. For those involved in estates, the CEA is a logical, recognizable solution, which also forms a network and a filter to your area of expertise. Sixteen other professions, all working with executors and testators, will be far better educated about what you do, having taken the CEA program. This is a remarkable new network. A significant portion of the wealth in Canada is held by people aged 65 and over, yet this demographic can be difficult to engage and hesitant to act. Their executors, on the other hand, will want to minimize estate challenges of taxation, illiquidity and inequality, and they have a vested interest in facilitating discussions. Any life insurance broker / agent interested in assisting with the $1.5 trillion dollar transfer of wealth over the next 20 years (source: STEP Canada) will benefit from the CEA designation, which provides instantly recognizable value as a professional who can help executors and testators. Mental Health Counsellors provide incredibly valuable services in estate situations, such as grief counselling, stress management and conflict resolution. Many of these services are not considered by those working in more traditional roles assisting executors, but they will after taking the CEA program. Sixteen other professions, all working with executors and testators, will be far better educated about what you do and are perfectly positioned to refer clients. This is a major opportunity for counsellors. Those in the estates business talk a lot about the problems of estate taxes, insufficient liquidity and estate division, but don’t talk much about mortgages, which are the solution to most of these problems if the testator has already died. Sixteen other professions, all working with executors and testators, will be far better educated about the importance of what you do, having taken the CEA program. This is a remarkable opportunity for mortgage lenders to network and engage in a previously untapped market. Many paralegals have a difficult time explaining what they do. Even industry definitions can make a person’s head spin. For those interested in working with executors and testators, the CEA program may be the defining catalyst, providing a better way to articulate what they do. Certified Executor Advisor is a perfectly clear term to average Canadians, and a perfect fit for those working in the field. Planned Giving Officers provide valuable services for philanthropic testators intending to pass funds to charities through bequests and other planned gifts. They’re a remarkable and often untapped resource for many who may not understand the relationship between gift planning and estates, until now. Sixteen other professions, all working with executors and testators, will be far better educated about planned gifts and planned giving officers, having taken the CEA program. It’s like a super-CAGP network. For many executors, the P&C insurance broker is one of their first contacts, particularly if the decedent’s home will be unoccupied for a period of time. It’s an opportunity to forge a relationship with executors; the person in the family with a high level of responsibility and influence, to maintain the business and expand the service offered to more clients (other family members) and across other product lines. The CEA designation is a way to demonstrate that the issues that matter to them also really matter to you. With 106,000 realtors in Canada, it’s amazing how difficult it is for realtors to differentiate themselves. Estate sales have vastly different economic parameters and potential pitfalls than regular home sales, but realtors currently have no way of communicating their knowledge in this area. However, the 16 other occupations who have taken the CEA program are aware of these issues and will be looking for realtors who can help their executors. No doubt CEA-accredited realtors will be in hot demand. In addition, the Find A CEA Directory enables executors and other professionals to locate you by occupation / profession and by geographical region across Canada. The networking opportunities, both nationally and locally, through CEA Round Table Meetings and co-operative events, advertising and other initiatives, provides a compelling new forum for promoting your business directly to the executor and testator community.